Oh my, it's been more than a week since I've last talked to you! I don't think I ever went MIA for this long before in all those years I've been blogging - my apologies. I've been enjoying holidays the past two weeks: I mainly majorly chilled out, went on a super fun city trip to New York City and ate way too much. My job can be pretty busy and when the time comes to relax a little.. I gotta do it thoroughly. The break also paid off: I'm feeling so recharged and I'm full of blogging spirit and ideas again. Let's start off with a new edition of my Sunday Favourites - a little instalment of things I've really been enjoying lately. This isn't a weekly feature as I don't want to promise you an article like this every week, but I will try to put these together as often as I can. #1.. I've already read the book "The Happiness Project" by Gretchen Rubin, but I borrowed it from a friend and gave it back not too long ago. More than a year has passed since I first read it and I'm very keen to get started on this book again. It's one of those coaching books that you have to read again every now and then just to remember what it taught you. I think there's something in this book for everyone - there are chapters about a whole lot of things in life and some of them were eye-opening for me. This isn't one of those weird books with crazy life advice, but a guide on how to change little things in life for you to be happier. I've recommended this book to a lot of my friends so it was about time I put this one on the blog. #2.. On the book you'll see my super funny Grumpy Cat magnetic page clips that I bought in Barnes & Noble while we were sheltering from a crazy stormy rain episode in NYC. I'm a big fan of a few celebrity internet pets and Grumpy Cat was probably one of the first I discovered! Now where are those Tuna Melts My Heart clips..
#3.. The super adorable Chu Lip in a limited Daisy Duck Tsum Tsum edition my friend Lisha gave me as a souvenir from her trip to Japan. She sent me a picture of the display when she was there and I totally fell in love. I had no idea she got me one, so I was so surprised and happy when she gave it to me. 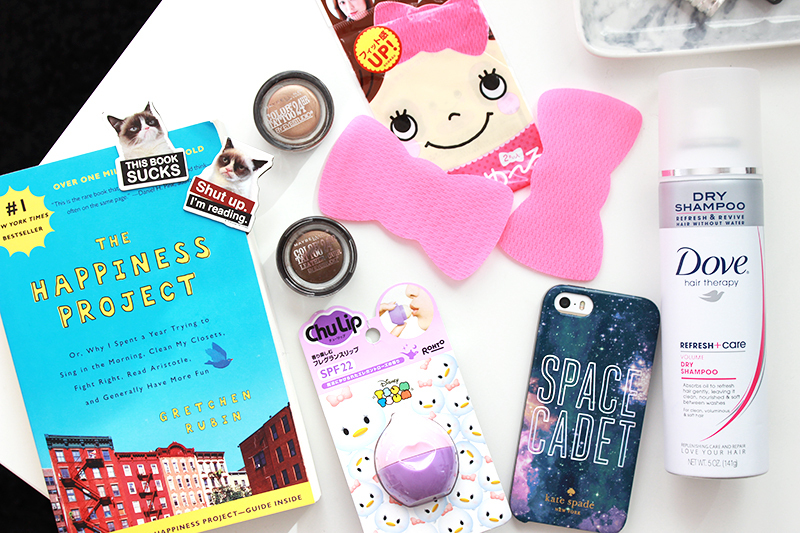 The Chu Lip balms are basically like an EOS lip balm. The name is a bit of a play on the word 'tulip' which is why they're shaped like one, while Chu also means 'kiss' in Japanese. The Daisy one has a rose scent and the cap and container are dyed in Daisy's main two colours pink and purple.So cute! #4.. 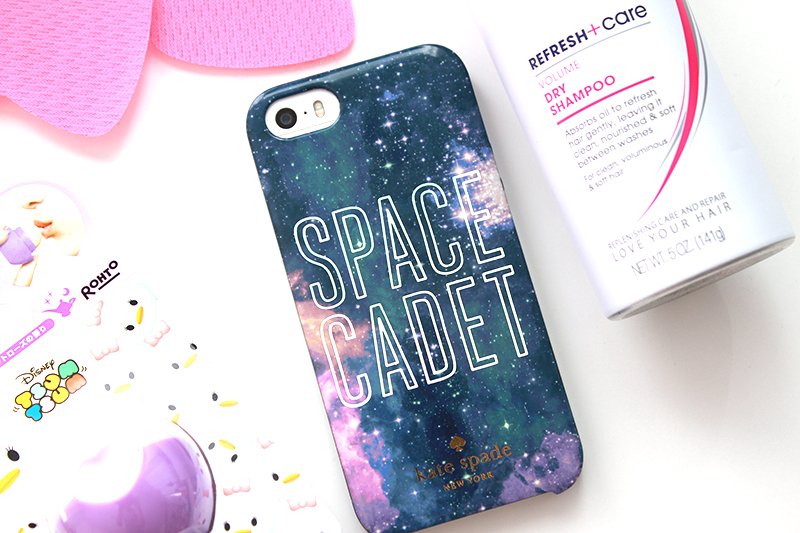 I knew I wanted to buy one of the super cool Kate Spade phone covers when I was in NYC, but I didn't expect to still find this Space Cadet one in the Macy's sale! I bought it with a nice discount, so naturally I was all smiles when I walked out of the store with this find. Isn't it funny? They also used to have one that said "Head In The Clouds", but this one is even cooler. Keep your head in the clouds and your feet on the ground! Yep, I'm a dreamer..
#5.. I'm a bit of a dry shampoo fanatic ever since I've decided to wash my hair less. Two years ago I used to wash my hair every single day and it really took its toll - it lost more hair, it was much more fragile and it became greasy after a day so I never felt like I could skip a day of washing. I have been reading about girls washing there hair only once in two weeks and while I would never be able to do that, I did stretch it until five days once. Dry shampoo is your saviour when you want to try this out too! I have tested so many of them and in NYC I came across the Dove Refresh + Care Volume Dry Shampoo at CVS. It is such a fine spray: it's really unnoticeable in your hair! It revives greasy hair in a matter of a few spritzes and to top it all off it smells like all other Dove products.. Absolutely divine! I am seriously smitten with this dry shampoo and use it on the day(s) between washing. Sadly it's not for sale yet in Belgium, so I'll be stocking up on a few bottles when I'm in London next month. Please Dove Belgium - introduce this one locally already, alright? #6.. On our first day in NYC we took a commuter's boat across the Hudson River to New Jersey and explored the boardwalk with some amazing views of Manhattan. On our way we also came across a Japanese mall with a huge beauty section! You know how much I love Japanese beauty stuff, so I was pretty pleased. I ended up finally buying two of these pink velcro hair bows that you can use to pin your hair back when doing your makeup. 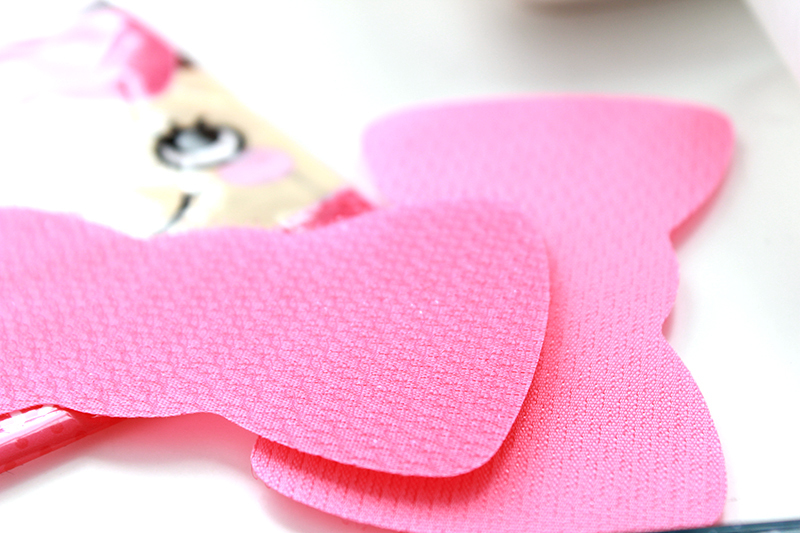 Very handy and super cute! 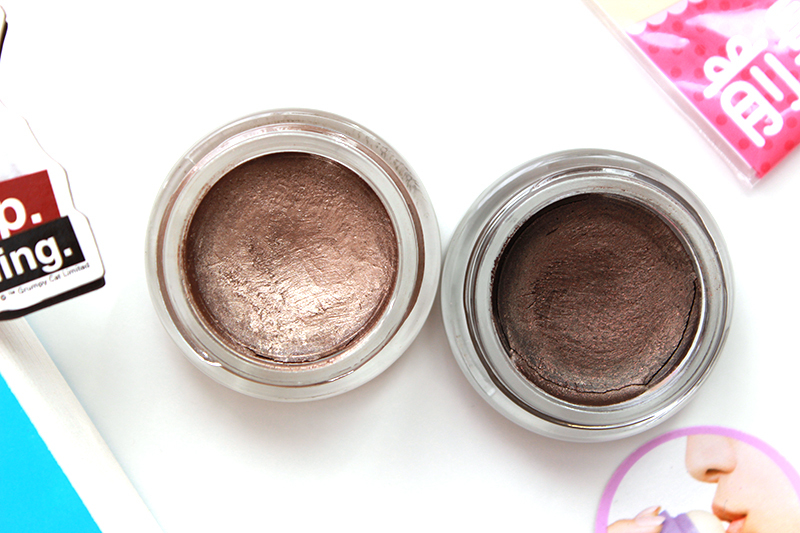 #7.. And last but certainly not least I've been obsessed with these two Maybelline Color Tattoo's I bought at Ulta. I got the Color Tattoo in 25 Bad To The Bronze and the Color Tattoo Leather in 95 Chocolate Suede. These aren't available in Belgium (again: please Maybelline Belgium, introduce these here!) and are absolutely beautiful. They are stunning when combined, but just as beautiful when used separately. I've read that the chocolate shade can turn a little patchy, but I haven't experienced any such issues yet. They are advertised to last 24 hours and I wouldn't know if it's true as I never keep on makeup for 24 hours, but I will say that these last all day! I wore these on a few very hot and active days in NYC from 8AM until 10PM and they didn't move one bit.. Colour me impressed! I'll feature these in a look soon. Enjoy this beautiful Sunday! I'll be back soon with a few exciting makeup posts and a NYC haul is also coming your way..